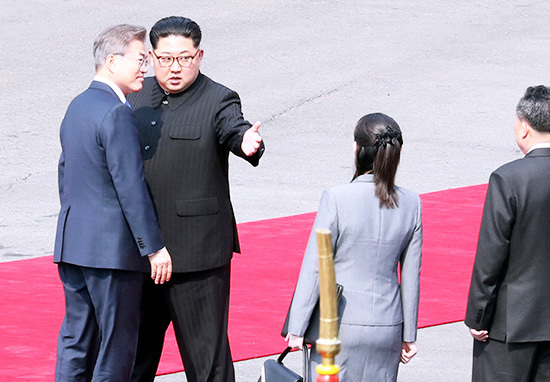 Kim Jong-un has become the first North Korean leader to step foot in South Korea since the end of the Korean War in 1953. 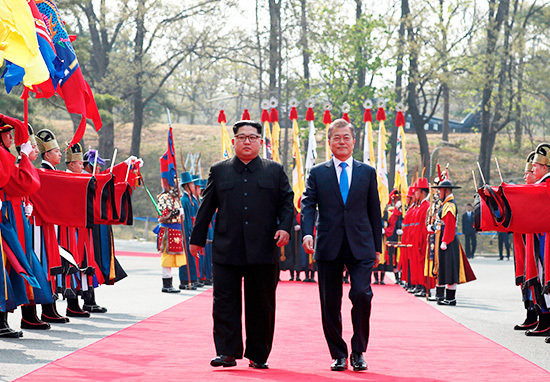 South Korean President Moon Jae-in and Mr Kim shook hands at the border, with the North Korean leader saying he hoped to have a ‘frank’ discussion. Audiences watched as the pair stepped across the demarcation line into North Korea, and stepping back into South Korea, while holding hands. The leaders were met by an honour guard in traditional costume on the South Korean side, writes BBC News. Their meeting, and holding of hands, was apparently an unscripted moment during what is being called a ‘highly choreographed sequence of events’. Mr Kim and Mr Moon retreated to the Peace House in Panmunjom, which is a military compound in the demilitarised zone (DMZ) between North and South Korea. A new history begins now – at the starting point of history and the era of peace. It is the first meeting between Korean leaders in more than 10 years. According to reports Jae-in said there were ‘high expectations’ they could produce an agreement which will be a ‘big gift to the entire Korean nation and every peace loving person in the world’. The White House said it was ‘hopeful’ the talks between the two leaders would make ‘progress toward peace and prosperity’. On the occasion of Republic of Korea President Moon Jae-in’s historic meeting with North Korean leader Kim Jong Un, we wish the Korean people well. We are hopeful that talks will achieve progress toward a future of peace and prosperity for the entire Korean Peninsula. The United States appreciates the close coordination with our ally, the Republic of Korea, and looks forward to continuing robust discussions in preparation for the planned meeting between President Donald J. Trump and Kim Jong-un in the coming week. Mr Kim announced last week he would suspend nuclear tests, which was welcomed by the US and South Korea as a positive step forward. As well as discussing Pyongyang’s nuclear ambitions, the two leaders are expected to discuss a path to peace between the two countries. During their meeting they spoke about Mr Kim’s gift of cold noodles called naengmyeon, a North Korean signature dish. I hope you will enjoy our naengmyeon brought from afar … oh, maybe I shouldn’t say ‘afar’? According to the Washington Post, Kim and Moon vowed to have more meetings. Kim reportedly joked he would make sure not to interrupt Jae-in’s sleep anymore, a reference to the ‘North’s drumbeat of early morning missile tests last year’. The North Korean leader also reportedly referred to a South Korean island his country attacked with artillery in 2010, killing four, saying the residents of Yeonpyeong Island who have been living in fear of North Korean artillery have high hopes the summit will ‘help heal past scars’. It’s early days for a relationship to build but this hopefully is one step in the right direction.